The Prairie Striders Running Club was organized on September 12, 1969, under the auspices of the AAU to promote jogging and distance running for fun, fitness, and fellowship at the instigation of Jay Dirksen, then track coach at South Dakota State University. The first president was Bob Bartling, who then continuously functioned as treasurer until 2012. The club has sponsored runs of every distance, from one mile to the marathon, and has teams representing it in many races in the Midwest. Prairie Striders also boasts one of the finest running libraries in the nation. 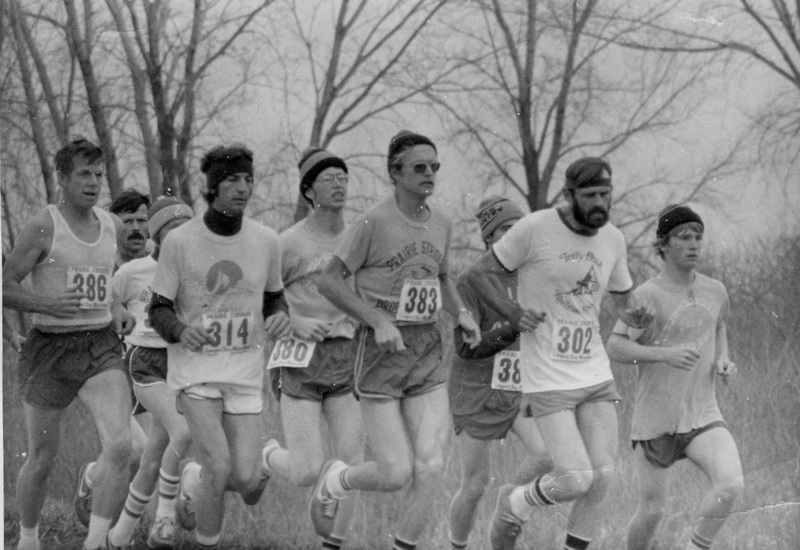 After debuting the Longest Day Marathon on June 21, 1970, on a hot Sunday on the first day of summer, the race moved to November in 1974 and stayed there through 1981. This 1977 picture shows local runners Harvey Mills (386) and Lyle Claussen (383) as well as John Lathrop, Valley Springs (380); Homer Hastings, Wyoming, (302). On each side of Hastings are Bryan Thoreson and Kelly Thoreson (38), both of Brandon. Other runners couldn't be identified.